Talk about hands on experience. While travelling overseas is a common mid-year break option for students, for UWA Master of International Relations post grad William Paparo it proved the perfect opportunity to hone his skills as a diplomat. 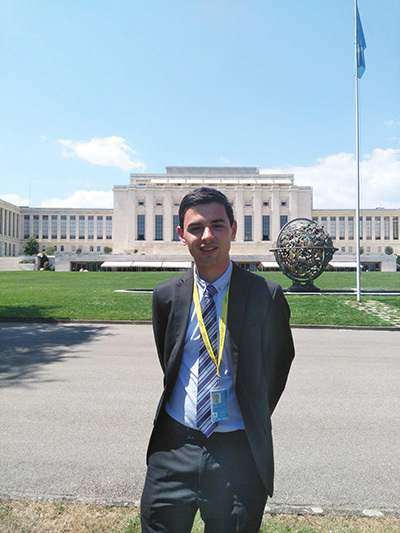 The enterprising Perth native travelled to Switzerland to take part in a six-week internship at the Australian Permanent Mission to the United Nations in Geneva. “When I started at UWA in 2014 I never imagined that, in just over four years, I’d be offered the opportunity of actually doing human rights work and even sitting in on UN Human Rights Council sessions,” William said. Readers of Uniview will be familiar with the Paparo family after William’s uncle Vince wrote a story (Uniview Vol 40, Autumn 2018, page 35) about his life growing up in Carmel with six siblings, all of whom went on to study at UWA. The Australian Permanent Mission to the UN in Geneva is responsible for representing Australia’s interests in the United Nations system and interns are involved in supporting and advancing Australia’s interests at the international level in a wide range of areas. William said interns can be required to represent the Australian Government in a formal capacity, such as assisting with negotiations of texts and resolutions and attending committees and meetings. “It was a great honour to be in Geneva helping, in just a small way, to represent Australia’s interest in the UN system and also fantastic that my years of study at UWA and strong interest in the field were put to good use,” he said. “I think it’s wonderful our government offers these opportunities to young Australians, particularly as, on 1 January this year, Australia began serving a three-year term on the UN body responsible for protecting human rights around the world,” he added. Next up, William will concentrate on completing his Masters at the end of this year, having already graduated with a Bachelor of Arts with majors in Political Science/International Relations at UWA in 2017. He also graduated this year with a Bachelor of Arts in Political Science/International Relations and Economics and Honours in Political Science/International Relations.